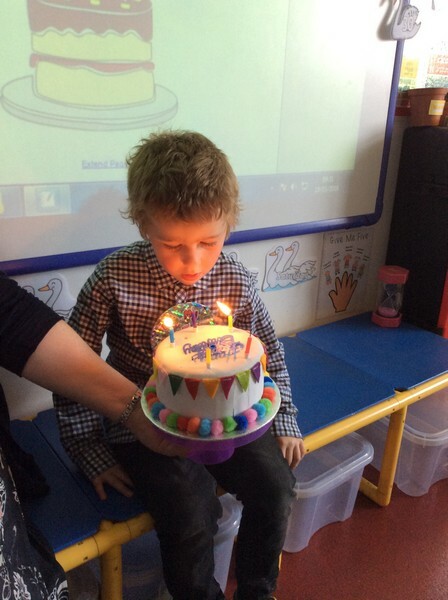 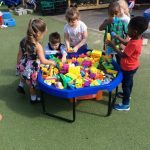 Read our latest class newsletter – click here. 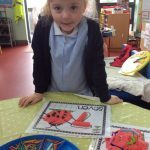 This week we have been looking at spiders as part of our topic on mini beasts. 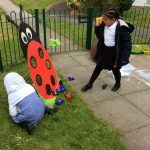 We found out they are not classed as insects because they don’t have six legs. 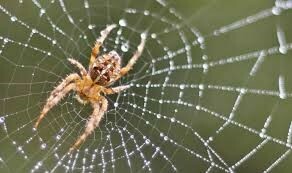 Spiders are classified as Arachnids and have eight legs. 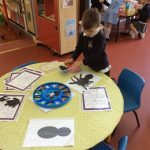 We read the story ‘The Very Busy Spider’ by Eric Carle and sang the ‘Incy Wincy Spider’ song. 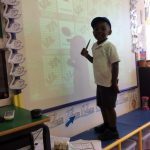 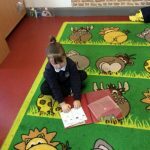 Children were encouraged to act out the story and sequence the song as part of our literacy activities. 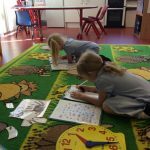 They also had a go at a word search. 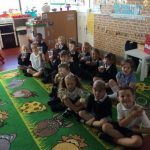 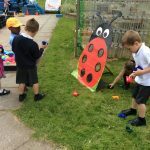 The activities this week have reflected our overall theme of mini beasts and spiders. 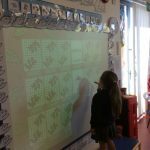 We have continued on with our doubling and halving, looked for bugs and counted how many we found, classified bugs into those that had wings and those that didn’t and played a memory game of pairs on the IWB. 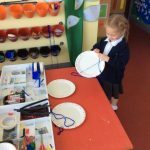 Our art and craft work also reflected our theme this week and children made spiders webs at the creation station. 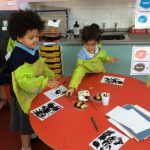 They also used potatoes to print a spider shape and a paint brush to add details at the art table. 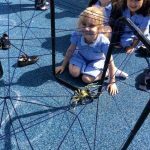 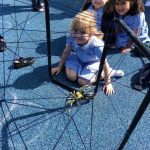 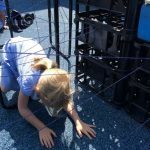 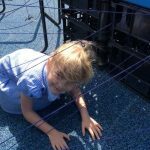 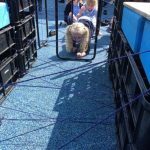 We carried the theme on outside too and encouraged to children negiotate their way through a large scale spiders web. 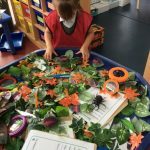 This week we began a topic on mini beasts. 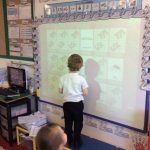 We started off the week by finding out what we already knew about insects, creepy crawlies and other mini beasts. 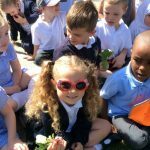 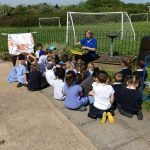 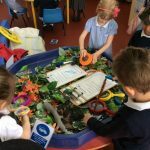 Children pretended to be scientists and investigated a pretend mini beast habitat using magnifying glasses to look more closely at the mini beasts. 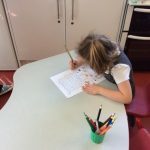 They were encouraged to record their findings. 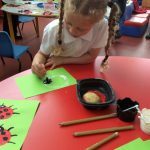 Our focus insect for this week was the lady bird and we read the story ‘The Very Grouchy Ladybug’ by Eric Carle. 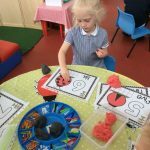 The spots on a ladybird lend themselves to math activities such as counting, doubling and halving. 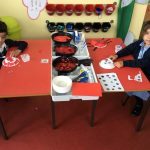 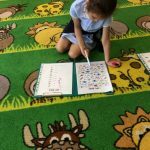 Most children were quick to pick up the language and use it while participating in various math activities set up around the room and in our direct teaching math sessions too. 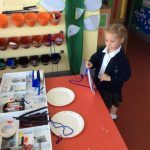 Our art work also reflected our theme this week. 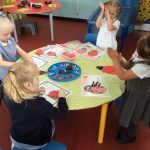 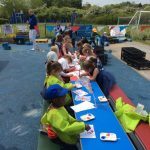 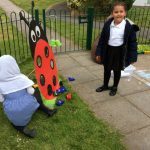 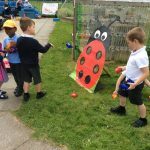 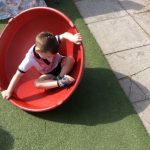 We carried the theme on outside too and encouraged to children to develop their throwing skills by using the bean bags and tossing them into the ladybird target. 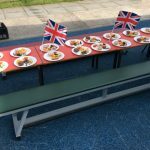 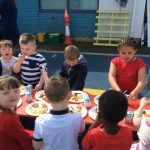 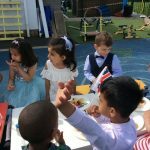 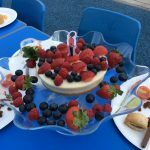 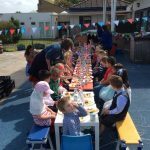 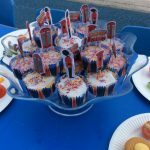 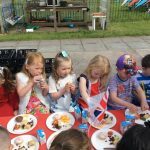 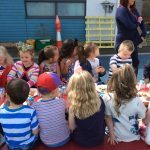 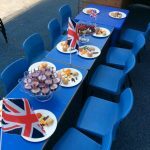 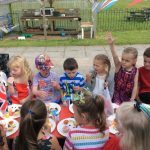 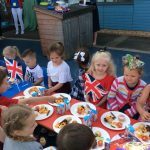 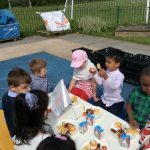 To celebrate the wedding of Prince Harry to Meghan Markle tomorrow, we had our own street party in the Reception playground and were joined by the Nursery children. 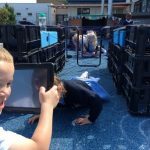 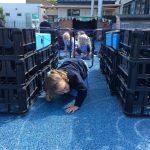 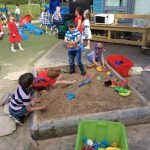 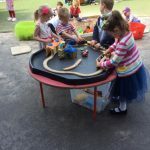 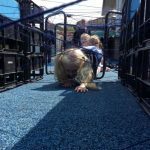 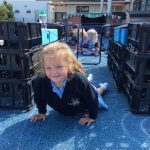 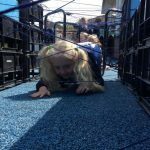 We began the session playing in the nursery playground while the reception playground was set up. 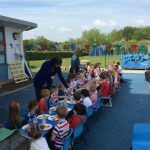 Then the children came and sat down to eat. 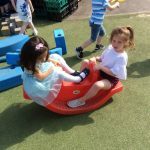 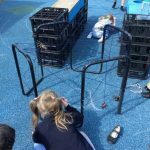 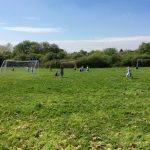 Once the Nursery children went home, the swans played some games. 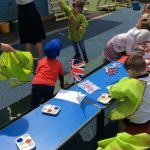 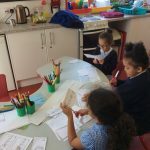 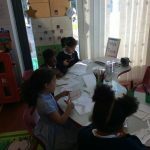 In the afternoon children had the opportunity to take part in some wedding or royal themed art activities. 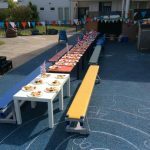 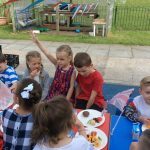 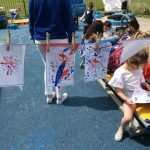 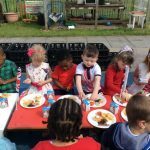 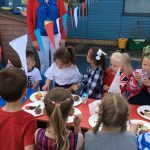 Children made red, white and blue bunting to decorate the playground and bought in food to share with their friends. 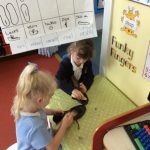 This week as part of our Elves and the Shoemaker theme, children have been learning how to polish shoes. 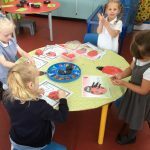 They carefully applied the polish with one brush in a circular motion and then buffed the shoes for shine with the other brush. 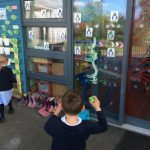 We had some very talented shoe shiners! 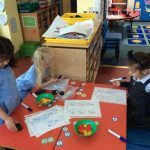 As part of our theme we have been counting in twos. 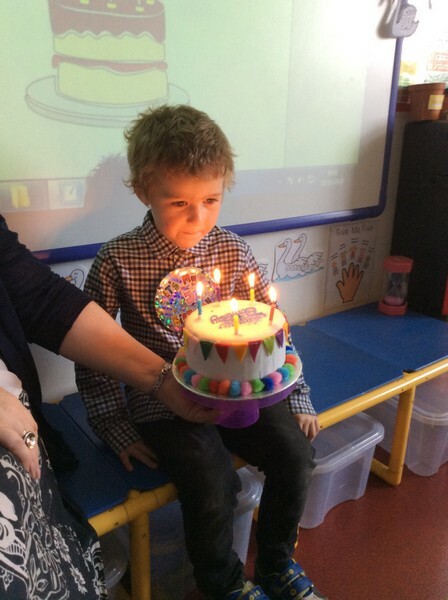 Two feet, two socks, two shoes! 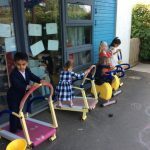 We then went outside to count in a larger scale. 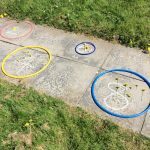 We used hoops to collect the correct amount of flowers in to match the number written in chalk on the path. 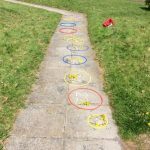 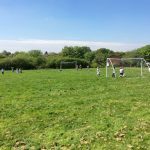 Children loved looking over the field for dandelions and daisies to count. 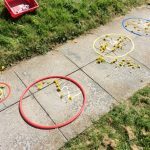 We have also been playing other math activities outside too. 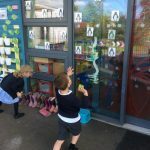 We had sticky balls to throw at numbers stuck on the windows. 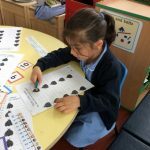 We had to match the number and then count it. 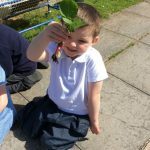 Over the last few weeks we have been busy planting and growing different plants in our Reception garden. 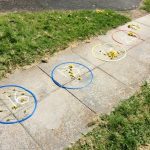 So far we have planted sunflowers, radishes, lettuces, potatoes and strawberries, along with our bean plants too. 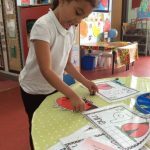 We are very proud of our growing achievements.